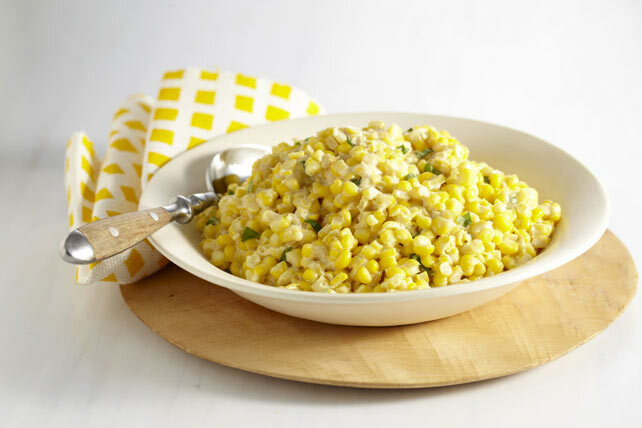 Savor the flavors of summer with our scrumptious Savory Creamed Corn recipe! Fresh corn and creamy sour cream give this creamed corn recipe its name. Melt butter in large nonstick skillet on medium heat. Add corn; cook 6 min., stirring frequently. Stir in sour cream; cook and stir 3 min. or until heated through. Remove from heat; stir in cheese and basil. For an extra kick, sprinkle with ground red pepper (cayenne) just before serving. To remove kernels from an uncooked cob, hold cob firmly at an angle. Carefully cut down the ear (away from the body) with sharp knife, several rows at a time.